In the Gulf of Mexico on April 20, 2010, the Deepwater Horizon oil rig exploded, creating the worst oil spill in American history. This film recounts the extreme moments of bravery and survival in the face of what would become one of the biggest man-made disasters in world history. On a seemingly ordinary day, an engineer named Mike Williams (Mark Wahlberg) says goodbye to his wife (Kate Hudson) and daughter before heading off to sea. But once aboard the oil rig, he finds his senior, Jimmy Harrell (Kurt Russell), is in a conflict with visiting BP executives, who insist on a drilling operation going ahead despite safety concerns. 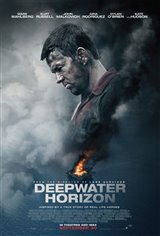 When Louisiana BP manager Donald Vidrine (John Malkovich) forces the workers to run a series of pressure tests on the rig, the pipes overwhelm, and the men are soon fighting for their lives on the burning oil rig in the middle of the sea.